BLOCKED DRAINS? IN NEED OF AN EMERGENCY PLUMBER IN SUSSEX, SURREY, KENT, HAMPSHIRE & LONDON? CALL: 07772 535248 – 24 / 7 EMERGENCY HELP. DrainBoss Plumbing and Drainage is a family run, Trading Standards approved drain company, and is a member of the “Buy with Confidence” scheme. 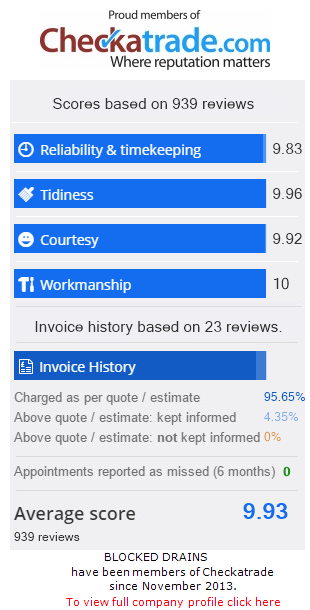 We have an enviable reputation for providing stellar service on every type of plumbing & drain clearance emergency, which you can see by viewing our customer feedback on checkatrade.com. DrainBoss is also CHAS accredited (Contractors Health and Safety Assessment Scheme). Anything from a blocked drain, blocked toilet, septic tank emptying, CCTV drain surveys, drain repair & installation, & gutter cleaning; we offer 24/7 emergency blocked drain assistance throughout the areas of London, Kent, Surrey, Sussex, Hampshire, Crawley, Brighton, Haywards Heath, Sevenoaks, Burgess Hill, Crowborough, East Grinstead, Eastbourne, Horsham, Hove, Lewes, Guildford, Redhill, Reigate, Tonbridge, Tunbridge Wells, Chichester, Portsmouth, Worthing, Southampton & all the towns in between. We are an independently owned and operated plumbing & drainage business offering a fully comprehensive drain service for your home or business. We are local, not some distant franchise who simply has a toll-free number in the area. That means we can keep our costs low and pass the savings onto you just when you need it most…during a plumbing emergency. We are fully insured and fully equipped to service all of your emergency plumbing and drain clearance requirements. When you need fast, reliable, and efficient blocked drain plumbers who know how to provide the best service, call the Boss, Call DrainBoss. We are available 24 hours a day and 7 days a week to provide a full service response to any drain problem. Blocked Drains Cleaned and unblocked for Fixed Fee with no callout charge or hidden extras. Drain Unblocking throughout Brighton, Sussex, Surrey, Kent, Hampshire & London. DrainBoss Plumbing & Drainage – 24hour Drain Clearance. We never charge for a call out. Our drain clearance plumbers work to a standard pricing menu and every job is priced before work commences to unblock your drains or fix a leak, although, if you prefer we can charge by the hour but there will never be any hidden extras. We use local technicians & blocked drain plumbers to ensure a fast response to your plumbing emergency. We are experienced and fully trained to City & Guilds standards. We follow the highest standards of health & safety, and use the most effective, modern technology to make sure your home or business is fixed properly the first time round. When you need an emergency blocked drain plumber, call us today at 07772 535248 for fast, efficient local service at a price you can afford! Ten Reasons Why DrainBoss Should Be Your Drain Company Of Choice! 24 hours a day 7 days a week response, usually within one hour. We are not a franchise: lower overheads means favourable rates. You agree the price before any work commences and we will keep regular communication with you until job is completed. Your technician will be courteous, uniformed and highly trained. OAP, disabled and NHS staff discounts. Consideration to cleanliness and tidiness given at all times. DrainBoss are proud members of Checkatrade. So don’t hesitate to call us if you need the services of a reliable drain company in Sussex, Surrey, Kent, Hampshire or London.